Once the overcast grey gives way to pale blue and the sun’s rays rain down its warmth, cabin fever-suffering homeowners start throwing open their windows and doors. As they emerge from their hibernation-like states, their thoughts quickly turn to sprucing up their outdoor spaces. With the right layout, furniture and accents, you too can transform your ordinary deck or patio into a space that’s just as stylish and comfortable as the rest of your home. 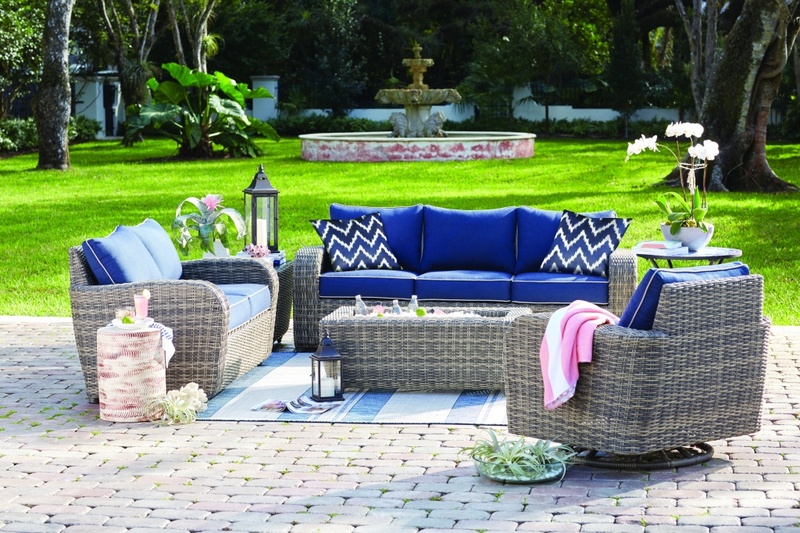 Visit one of Levin’s showrooms today to see the all-new collections at The Patio Place. Open 10 a.m. to 9 p.m. Monday through Saturday and 11 a.m. to 7 p.m. Sunday. Taking your outdoor space from drab to fab doesn’t mean you have to sacrifice style or your bank account. It does mean that nosey neighbors will want to sneak a peek at your backyard retreat and get the “dirt” on your design secret. So, what IS your big secret? Let’s get back to reality. The answer to their question is that there is no ONE secret. This most important of steps is often the most skipped in the excitement and anticipation of showing off and enjoying your fresh, new space. This mistake ends up not only being costly, but also it could be the downfall of your whole project. No one wants to feel like they’re sitting in an oven with no place to escape the sun’s direct heat nor the shiver of that stubborn wintry chill that is still grasping tight to the breeze. You and your guests need some type of reprieve from the elements. How many of your friends enjoy watered down beverages due to rain? Umbrellas, sun shades and pergolas are not only functional, but also they come in a variety of shapes, styles and colors to match the rest of your selections. The Patio Place at Levin’s is a great place to find many patio umbrella options. 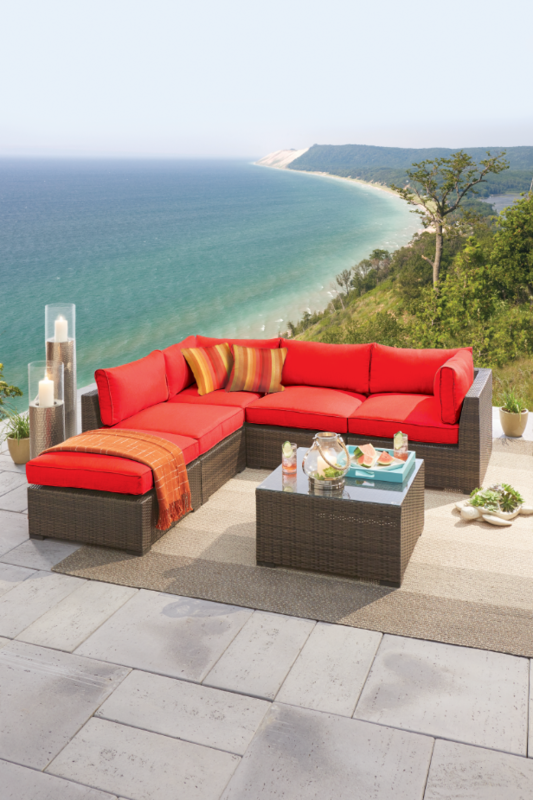 You’ll also find collections of outdoor sofas, sectionals, dining sets, fire pits and chat sets among others. Mount Laurel Fire Pit Chat Set. Consider this: your furnishings can suffer the effects of the elements just as you do. Think about the durability of your products, where they’ll be located and other factors that secretly may be lying in wait to sabotage your morning coffee on the patio. Busy street? You may want add some type of sound muffling or privacy barrier like a fence or landscaping. Less than perfect landscape? It may seem like you can hold off on prepping the terrain around your space until later, but postponing that French drain or the trimming of those low hanging limbs on that oak very well may end in disaster and unnecessary extra dollar signs. The next step is probably just as important as the first. How do you want to use your space? If your sole purpose is relaxation, your approach and furnishings will differ from those of a griller’s paradise, party central, family lounge space or even casual dining. Realistically, you want your outside areas to be multi-purpose, which requires your furniture to be just as accommodating. The groups you’ll find at The Patio Place by Levin’s not only give you the function you need, but also they are durable. 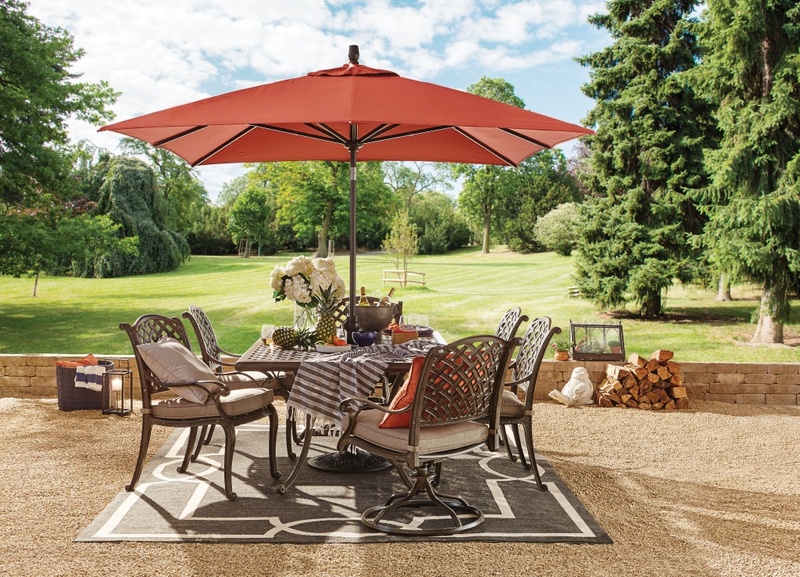 Levin’s affordable, yet high quality collections feature weather-resistant aluminum and ED-coated steel frames as well as water-resistant fabrics for maximum durability. 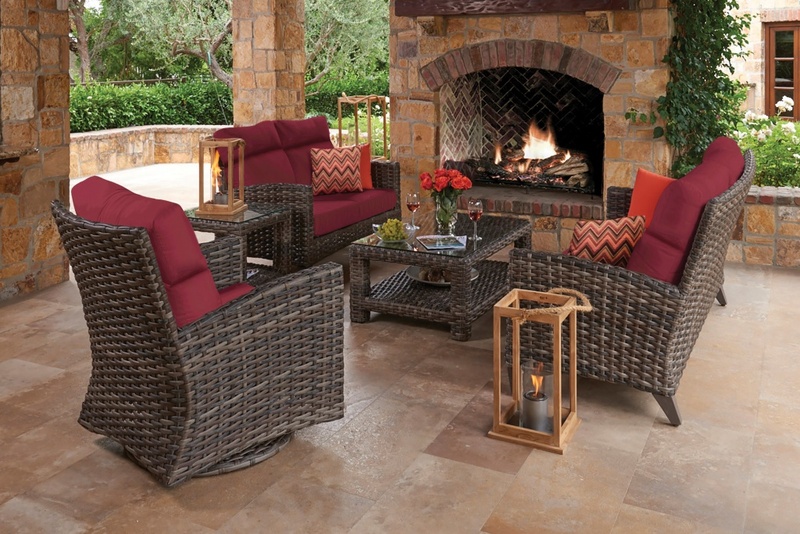 Take, for example, the casual comfort of the Cherry Hill or Oak Ridge collections by The Patio Place at Levin’s that employ resin wicker to withstand the elements and provide you with an inviting living room atmosphere. 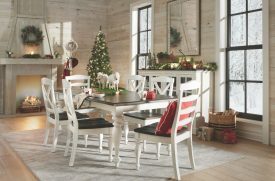 Each collection offers maintenance-free table tops that tie together the homey look while purposefully providing areas to display accessories, set down a drink or pull up as small dining space. Speaking of moving pieces, movement is a consideration in the next step. In order to really focus on flow, you’ve got to be “space minded.” Where you place your furnishings and how people move through the space could make the difference between an uncomfortable evening of literally rubbing elbows with someone or the effortless transition from one conversation to another at any given spot on your patio or deck. Easy-to-move or rearrange pieces like the Chelsea collection at The Patio Place at Levin’s allows you to place pieces where they allow your guests movement obstruction-free from inside to outside and around your entertaining area. If you’ve got the space, feel free to outfit your patio with more than one outdoor sofa or sectional, lounge chairs, end tables or ottomans. However, be sure to allow for at least 24 inches, if not more, for heavy traffic walkways. If it’s set up thoughtfully, you’ll have plenty of seating for your neighborhood cookouts and holiday picnics. Ideal flow is easy to accomplish if you intentionally separate your spaces. You wouldn’t put your dining table in the middle of your living room and try to talk over the din. So, it wouldn’t be logical for you to cram all that “function” into the same part of your porch. Sectionals or the long back of a sofa makes a perfect “wall” to separate your sitting space from your dining section from your conversation area from your cooking corner. 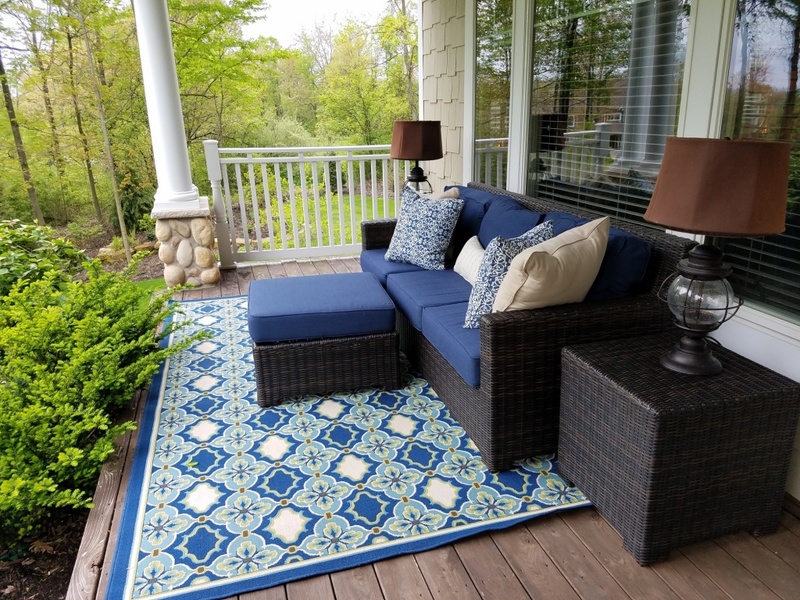 Additionally, outdoor area rugs can be used to anchor the furniture to that particular space, and that’s something to consider again in a later step. Your dedicated spaces are sure to pull people in by highlighting a key design element. Chat sets and fire pits make excellent focal points. There’s just something about the warm glow and dancing flames of a late evening or nighttime fire that brings everyone together. 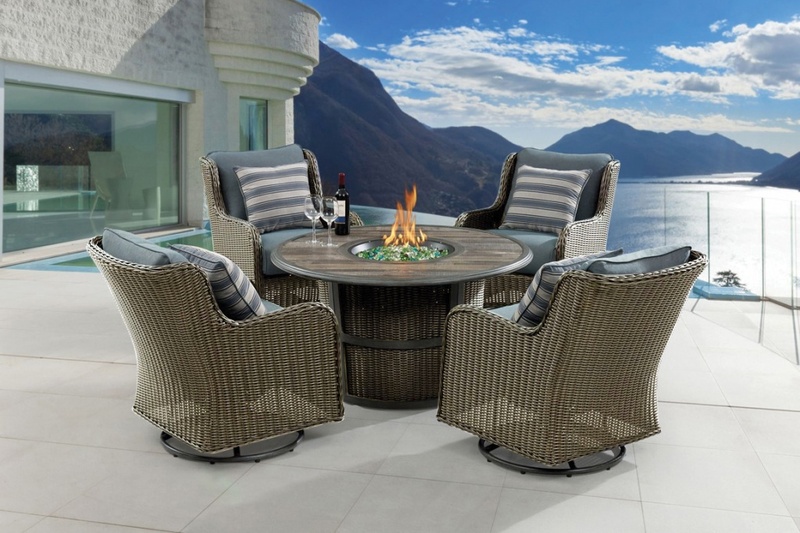 The Patio Place at Levin’s offers fire pits and chat sets like the Mount Laurel or Edison collection, which has an embossed cement ledge that’s as perfect for your coffee mug as it is for a dinner plate. If you’re looking to bring some of your indoor luxuries outdoors, consider Levin’s Brunswick or Siesta Key collections that feature richly saturated color palettes and reclining options. The Greenlawn collection is another option with its deep suspension seating covered with durable yet comfortable Sunbrella fabric. Nearly all of the fabrics used in The Patio Place by Levin’s are mold, mildew and fade resistant ensuring enjoyment for many seasons. No one will mistake the location of your outdoor dining area when it features the Claremont or Mount Laurel dining collections. Your guests will be raving about your food and the furniture. These show-stopping sets can comfortably seat six or more dinner guests with plenty of room for individual place settings or family-style dining. But, let’s not forget the intimacy and romance of more proportionally sized sets like the Halston collection. The size and scale of your furnishings play an integral role in the atmosphere your space exudes. Scale and separation can really kill or contribute to a conversation. Too big and you’re left with no choice but straddling and side stepping the knees of everyone down the line, stubbing your toes and banging your shins along the way. Too far apart and your friendly gossip session just turned into public knowledge. For a more spacious family-friendly lounge area, you might consider either the Dover or Seville outdoor sectionals found at The Patio Place at Levin’s. Enjoy family game night under the stars atop Seville’s spacious coffee table or curl up in the corner with a good book and cozy throw you pull out of the Dover storage ottoman. Smaller scale spaces would call for more appropriately sized or multifunctional collections like Mount Laurel. This smart collection features the space-saving option of storing the two additional ottomans under the coffee table until needed. Another suggestion is the Bray collection that exudes sheer minimalism. All things considered to this point, you’re well on your way to a perfectly appointed living area that just happens to be outdoors. The last two steps will act like the icing on the cake. Before you can start the accessorizing, look up- look out- and look down. What do you see? Your gaze should fall upon a few key elements that will make your guests feel welcome and secure. Looking up should illuminate the eyes (but not too much) with the soft glow or twinkle of outdoor string lights, lanterns or even chandeliers. You’re lighting can help you set the mood for the type of evening you have in store. Did someone say mirror ball? Looking out should allow you the sight lines you desire. Some people revel in the unobstructed view of their entire surroundings. Others like to draw the attention into their area. You can choose outdoor shades, screens or greenery to give you the flexibility of both options. Looking down should give you a sense of comfort. Varying styles and textures of outdoor area rugs can tie together the entire design. They also are a great way to cut down on grass clippings and other debris tracked into your home. You may think you’ve considered everything now, but hold on for just a few more minutes. Designed by Brian Sleamon of The Decorating Studios at Levin’s. In between and among the levels you just addressed are perfect little crannies to showcase your individuality, personality and style with accessories. It’s fun to add a dash of whimsy and intrigue. Showcase some of your travel souvenirs for conversation starters. Add an element of relaxation with the soothing trickle of a water fountain. Throw in a splash of color with fun patterns and a mixture of textures with accent pillows. Table top lanterns add a soft, comforting or even romantic glow. Speakers have come a long way from the obtrusive boxes of the past. Potted plants and flowers can line the perimeter, fill in gaps or hide less than desirable objects like power cords. No matter what you use, you should choose pieces that mean something to you. Truly great spaces feature the things that are most important to you. Whether its function, style, personality, quality, organization, entertainment, value, beauty, relaxation and the list goes on, the truth is you can and should combine any or all of these into your outdoor oasis. Let’s be honest. Not everyone has the time or desire to take on a patio redesign. The experts at The Decorating Studio at Levin’s offer in-your-home, or in this case outside-your-home, design services. You simply choose the design package with which you’re comfortable, and let them work their magic- with your input throughout the whole process. Levin’s has been your trusted local furniture and mattress store for nearly 100 years, and their outdoor collections provide the same high quality, excellent value and outstanding service you’ve come to expect. Visit one of their showroom today to see the all-new collections at The Patio Place. They’re open 10 a.m. to 9 p.m. Monday through Saturday and 11 a.m. to 7 p.m. Sunday; or 24/7 at www.LevinFurniture.com.